Dogs are an important part of our families, but they are also a great way to bring our families together. Helping care for a dog can even teach our kids about responsibility. Moms and dads don’t have to do all the work! Get your child involved in caring for their pet from the moment it comes into your home to create a great environment for your pup, as well as your entire family. This article is sponsored by Village Veterinary Practice, but all tips are our own. This photo was taken at Village Veterinary Practice where kids can even get involved in pet care at the vet! Village Veterinary Practice was established to care for your pet as a family member and to make the family-pet bond an enjoyable, healthy and life enriching experience. They offer a variety of veterinary services for dogs and cats in two locations – Clarendon Hills and Western Springs, IL. They provide wellness and preventive care, surgery, dentistry, diagnostic laboratory and digital radiography services. They also provide in home veterinary care by making house calls. Their knowledgeable and compassionate veterinarians will make the best recommendations regarding the health of your pet during each life stage, all while respecting the wishes of our clients. They look forward to building a trusting relationship with you and providing lifelong healthcare for your beloved pet! The entire family really can get involved. As soon as your son or daughter is old enough to talk, they can start learning commands to direct your dog. It’s great if your child thinks of their furry friend as a true best friend, but it’s important that your dog understands the chain of command in the household. So, if your son or daughter can say “sit,” then let the training begin! As your child continues in and through preschool, have them join in on walks. They can also help with new tricks and training activities. If you trust that your dog will not pull during the walk, have your child take hold of the leash! This will help reinforce the chain of command in your household. It can also give your child extra confidence that they are not only helpful, but capable of doing important tasks! Once your child progresses to elementary school, a world of possibilities opens up. They can start training on their own, because they’ll better understand the why and how of how training works. Plus, they’ll also understand what it means to have responsibility! This is an excellent chance to incorporate the whole family into the feeding process. Have your child set a reminder or create a schedule to post on the refrigerator around when to feed your furry friend. This establishes your child further in a master role — research shows that being the “keeper of the food” is one of the absolute best ways to make sure your dog knows who is in charge. 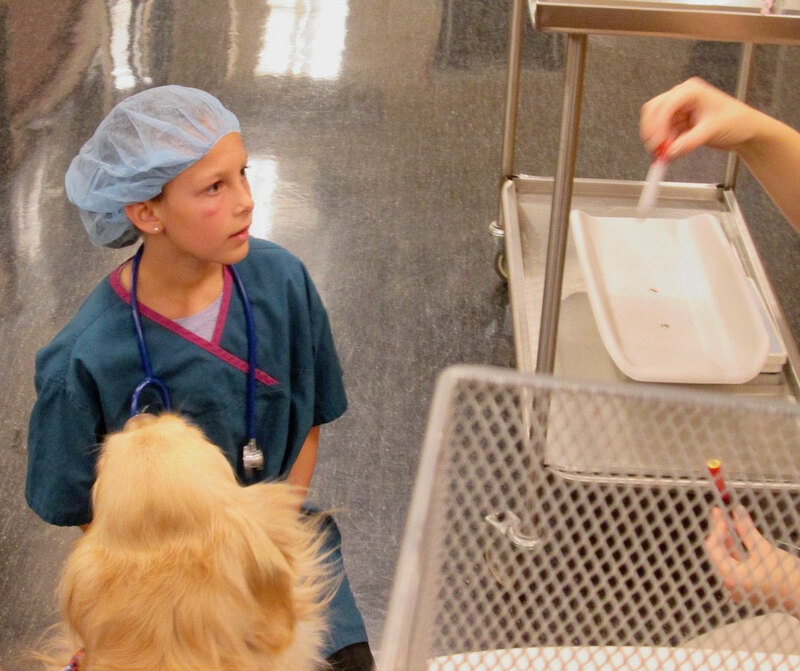 Beyond that, kids can come along to the vet to see firsthand that pets require medical care. Let them participate in your dog’s dental care, too. Finally, let’s talk about the tweens, teens, and young adults in your household. At this point, almost anything is on the table. This is a great opportunity for them to understand what a heightened level of responsibility actually means. Walks, feeding, training, tricks, treats, and medical care . . . all of these teach beneficial life lessons. Kids learn what it actually means to be the sole owner of a pet and have the responsibility to care for another life. Perhaps even better, it also means that all able members of your household are consistently contributing to household responsibilities. Your furry friend is a big responsibility, so start sharing that responsibility with your son or daughter early on! Getting the family involves makes for a very happy furry friend! Want more local pet resources? Check out our Furry Friends Guide for dog owners, sponsored by Robert Hutchison, a talented and personable Realtor for the western suburbs! Be the first to comment on "How to Get Your Kids Involved with Dog Care (by Age Group!)"